Quilting Adventures: Off on an adventure ... ! Off on an adventure ... ! Sunday, I just had to get away and clear my mind. I get like that every now and again. So, I took off in my car with no specific destination except eastward. As I drove through the Vermont country roads, a thought came to mind, "Hum ... maybe I'll head to Center Harbor", a mere 4.5 hour drive south east! As I drove in that direction, it suddenly became clear as to where I should have my adventure! Have you ever been to the Vermont Country Store? I had heard a bit about it, even perused one of their catalogues. So nostalgic! They are known as purveyor of fine foods and nostalgia. They have two (2) locations and the history is quite interesting. The original one is in Weston and a newer one in Rockingham, Vermont. I had time on my hands, why not visit both? They are just 25 minutes apart! First stop was in Rockgham, Vermont. It really does feel like a country store. I didn't think of taking pictures of the inside, I was to busy enjoying being nostalgic! So much to look at! Afterwards, I took off for Weston, Vermont. It was approximately a 25 minute drive westward. I passed through the quaint town of Chester, VT. The drive was so scenic. Beats highway driving anytime! I so enjoy going through the winding roads, admiring the scenery! What a lovely way to be greeted! The Vermont Country Store is quite large and takes up a couple of buildings. They have a wide array of what is commonly known as "penny candy". But, let me tell you, they cost more than a penny now! lol I found my childhood favourite - Soucoupe Volante which translates into Flying Saucers! I was a six (6) year old in heaven! What fun I had perusing the various products. I will definitely be going back! Since, as of late, I've been on a cookbook acquisition mood, I bought their cookbook! 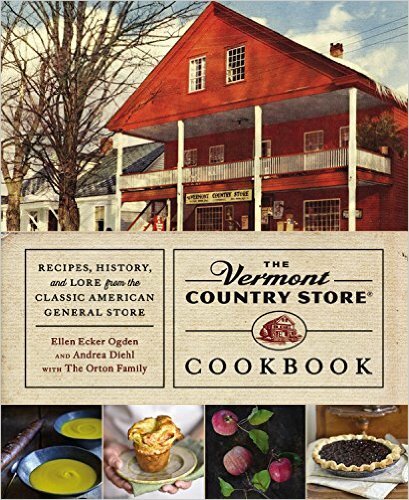 Lots of wonderful recipes as well as history of the store. Such a lovely book to look at! All and all, I logged over 400 miles on my car! What a great day I had! How was your weekend? I hope you had a wonderful one! Thanks for stopping by! Catch you later! Sounds like a fun day and would be fun to visit there. I do enjoy trying new back roads, you never know what you will see and it is much nicer than the highways. Thank You for showing. That store is gorgeous. I love Your trip. That sounds like our kind of journey - quiet, scenic, back roads. I would love to visit their store someday. I love their catalogs. I visited the original Vermont Country Store many years ago and have received their catalog ever since. Ordering is easy and the products fill so many needs. YES! I grew up in Rockingham, and although it is the newer location, it has still been there for many years. When we were kids we would ride down the dirt road just south of the water wheel & go in to get penny candy. The store was smaller then and we could get quite a haul with a pocket full of change. Then we would go hang out in the shade of the bridge until we decided to ride back home. It is still one of my favorite places to go for certain items and gift shopping. You were very close to me, I'm probably about half hour from there now. Next will have to look up your quilt shop! One of my best friends is a quilter, and I love to go along on adventures to check out different shops. Each summer we take a day trip up to Center Harbor & a couple times have then snuck over to a place or two in Maine (long day!) this year I think we are going for just Maine and a couple new stops. Do you participate in the Row by Row summer program? I think it is fun to see what row people have designed. Sadly I don't particularly sew much myself, but I still have aquired a pretty good stash of fabric none the less! I'm glad you had a fun get a way day! Oh how fun -- I love a good adventure and that one sounds so fun! I was never a fan of flying saucers, but I'll bet they had some of my favorites there -- um ... Big Hunk anyone??? Take the long way home ....!